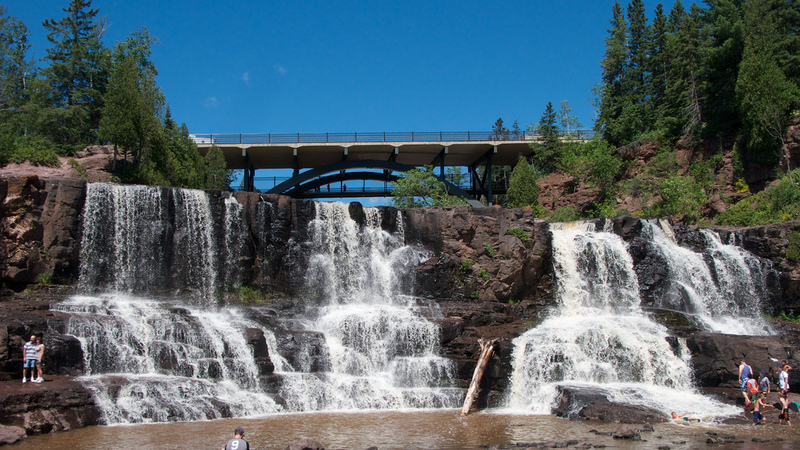 Gooseberry Falls State Park, situated on the bank of Lake Superior, embodies the shift of land use from extraction to recreation and reveals that the conservation mindset has always been present within the history of Minnesota’s tourism industry. The history of the park represents how Minnesota’s culture has come to coexist with the natural environment. Gooseberry Falls is a carefully manicured park containing miles of guided walkways and bridges fashioned to allow human interaction with the park’s landscape. Apart from its tourist-friendly infrastructure, the ecosystem of the park functions as naturally as any forestland in northern Minnesota. In terms of its creation, the Civilian Conservation Corps constructed the park in 1937 in order to make America’s natural environment more accessible for human enjoyment, and to allow the government to cash in on recreation. The romanticization of nature prevalent in the tourism industry is echoed through the imagery of Gooseberry Falls. A painted postcard from 1945 displays the grandeur of the falls in vibrant colors. In addition, the iconic north shore drive bridge that usually looms in the background of the falls is decidedly absent, which demonstrates the park’s desire to create an idealized form of nature void of human presence. 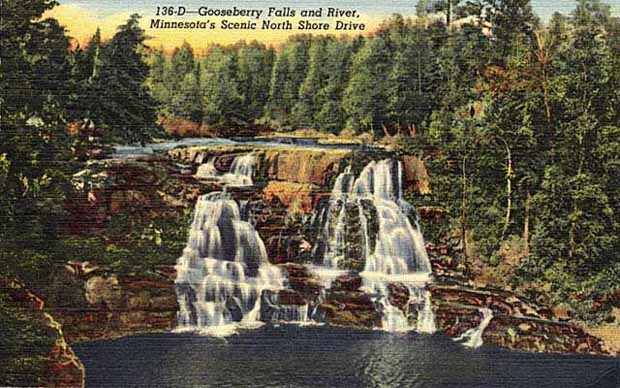 Compared to the reality of the falls in a photograph taken in 1930, it is clear that the postcard is using a sentimentalized image of the falls through color and the absence of human touch to attract the consumer to the vista. Indeed, the reality of the falls contains a high amount of human alteration, especially with the man-made bridge constantly hovering over the natural flow of the falls. 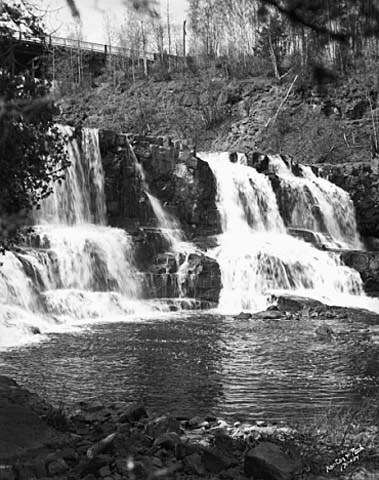 Before Gooseberry Falls became a state park, it was primarily a source of timber for the logging industry. In 1900, a logging company built its headquarters at the mouth of the Gooseberry River on Lake Superior, but by the 1920’s the pine had all but disappeared. Much like Bay and Cass Lakes, the use of the land constituting Gooseberry Falls has been both destructive and regenerative; however, no amount of preservation can revert the landscape back to its original state. So, in consideration of Gooseberry Falls, Star Island, and the Ruttger Family, has tourism fostered an effective industry that promotes ethical land use and conservation? 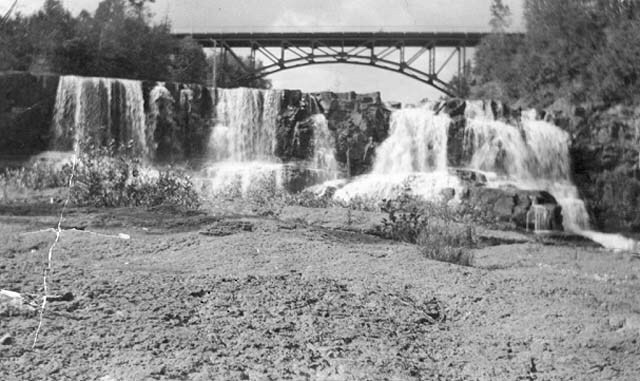 Charlie Kilman, Ben Pletta, and the Minnesota Environments Team, “Gooseberry Falls: Cosmetic Conservation,” Minnesota Environments, accessed April 26, 2019, http://mnenvironments.carleton.edu/items/show/28. On logging near Gooseberry Falls, see "Park History." Gooseberry Falls State Park. Minnesota Department of Natural Resources. 2014. The Minnesota Department of Natural Resources Website (online).